The Wyvern Hotel is a great boutique style hotel close to everything. It is directly across from the marina and within walking distance to shopping, parks and restaurants. The rooftop pool bar offers a great view of the waterfront and downtown. Here you can sit and enjoy a meal or go for a swim. The hotel has modern, luxurious rooms, a fitness suite and LuLu's upscale Latin Fusion restaurant. Imagine shrimp tacos, coconut lobster chowder and ripe plantain lasagna. Literally a stones throw from the Wyvern, Dean's South of the Border is a casual, relaxed place for an afternoon margarita or cerveza! If the Florida heat is just too much for you Dean's offers both indoor and outdoor seating. 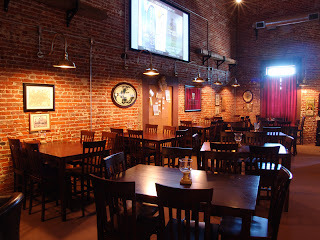 The Icehouse Pub is a great place to chill in the evening. It boasts being an authentic English Pub and Restaurant but I'll leave that up to the Brits to validate. It also boasts having the most extensive selection of beer and with its 24 taps and HUGE selection of bottled beers from all over the world I have no difficulty authenticating that as factual. From Austria alphabetically through to the US with names like Austria's Dopplebock Dunkel (which you can't say 3 times fast after you've had a couple), Scotland's Harviestoun Old Engine Oil, Kronenbourg 1664 and Left Handed Brewery Milk Stout there's an endless supply of temptations for the beer lover. Besides beer this place is a dart players dream with leagues and tournaments. Games like snooker, bar billiards, steel tipped darts, dominoes, Shove a Penny, Shut the Box, and Toad in the Hole are also available for patrons. If you're looking for something unique this is it! I could go on b-u-t . . . just get there! There is so much more to discover. Let me know what YOU find. I'd love to hear about it. My kind of town! Love the English pub.